One of the reasons that I started this blog is to share the actual files and workflows that I use from project to project. In that sprit I have made available an unlocked version of the database originally developed for the PARP:PS project. You can download the database here (see licensing below and in the ReadMe file that comes with the database). It is a FileMaker 12 database. The database makes heavy use of recently introduced features such as script triggers, conditional formatting, and charts. You can download a demo of FileMaker 12 from FileMaker if you don’t have a copy of the software. The older database, useable in FileMaker 11, is now here. 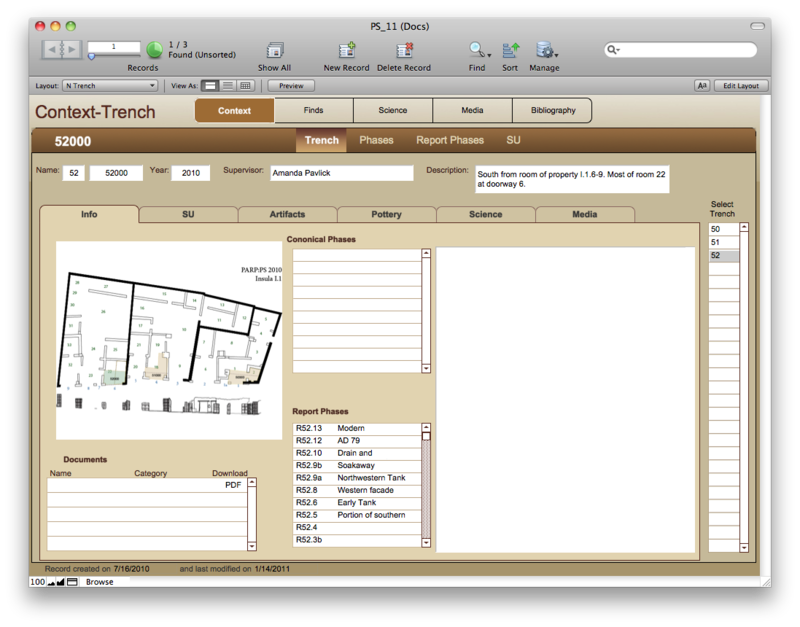 Like most excavation databases this one reflects the particular workflow and research goals of the PARP:PS project. Like most excavation databases, it should also be considered unfinished. I hope to focus more on the finds tables this year in preparation for the next summer’s excavation season. Thanks to Steven Ellis, director of the PARP:PS project, for allowing this database to be made public. PARPPS Database by John Wallrodt is licensed under a Creative Commons Attribution-NonCommercial-ShareAlike 3.0 Unported License. Sarah, the database is inside of a zip compressed folder, and can’t be immediately downloaded and used from Safari on the iPad. The folder contains some scripts and instructional items for handling images. You can either download the zip file to a desktop, decompress it, and side load the database onto your iPad, or you can download the zip file with something on the iPad that will allow you to decompress and send the fp7 file to FileMaker Go. GoodReader will do that. Thanks John, I’ll give it a go. Hi John, I have downloaded Goodreader and FileMaker Go. The database is in Goodreader, but I have no idea how you make it open in FileMaker Go. I’m not an IT person, and hope you can help me. I’m really at the Paperless Archaeology For Dummies stage!! Can you give me a step by step on how to get it open in FileMaker Go. I don’t want to give up as the database looks superb. Thanks for any help you can give and sorry to be so thick. It occurred to me that I had a link to the FM 11 version of the database which does not work with the current file format of FMGo 12. I changed the link at the top of this page so that you can download a FM 12 version of the file. You will still have to unzip it. To do that in GoodReader, tap on Manage Files on the right, then tap on the zip file on the left to select it. Look for an Unzip button on the right under the Manage Files header to decompress the file. Then tap the blue Done button under Manage Files. Navigate to the newly decompressed folder and look for the database. Tapping the PS_11_parent.fmp12 document won’t open it in FileMaker Go so you have to, again, use Manage Files but this time tap the file and select Open In… That will move the file to FMGo and allow you to open it as Guest. John you are a star! All working and opened in FileMaker go 12 no problem. Thanks for the step by step. I am going to be using the database to catalogue small and bulk finds from a WW1 dig. Is this best done in the finds detail section? And if so can I alter it to make it fit with the way they want it catalogued eg. Item type is domestic or military firearms or munitions etc. Sorry to be really stupid but where does all the data get saved? Is it just on the iPad or safe in cyberspace where everyone can access it? Thanks for all your help. Just found the user manual, so I’m busy reading it! Can we still get a copy of that database? Apologies. The link has been restored.